Ahhh, I do love to travel but it is nice to be home! I seriously love my bed. :) I hope everyone had a wonderful Easter. We were able to make it home from vacation in time to spend a quiet Easter at home. DH and I decided it was the perfect time to take the girls on a car trip for Spring Break (ala National Lampoon's Vacation). No...I have not shared that movie with them YET but it is getting hard to hold DH off. He loves those movies. Anyway, we started the trip driving to Niagara Falls. Absolutely gorgeous, so glad I finally had a chance to see them. We had planned to only see them from the American side and not mess with passports until we talked to my FIL. So glad he convinced us to update our passports and see the falls from Canada's side. It was definitely worth going through customs. Then we were off to New York City. We took a trip out to see the Statue of Liberty and Ellis Island, went up in the Empire State Building and got to see Wicked on Broadway. That is definitely one of my absolute favorite shows I have ever seen. It was amazing. I thought I would share a layout I made before I left though. I created this layout using some of the new My Mind's Eye from Emma's Paperie. Just adore their stuff. Before we left Bloomington L's 4th grade class did a musical version of Alice in Wonderland and our sweet L got to play Alice. She practiced really hard and I am so proud of the great job she did. I finally got around to scrapping the pictures. The layout is actually straight IRL. Had a hard time getting the lines straight in the photo of the layout though. 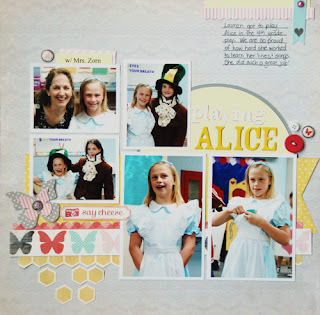 You can visit the Emma's Paperie Blog to find my supply list. Have a wonderful week and thank you so much for stopping by! So happy you listened to your FIL!! Canada side for the falls is sooooooooo much nicer!! I grew up around there and we went there almost every weekend!! I loveeeeeeeeeeeeeeeee NYC!! My home!!!!!! How exciting!!! And Philly!!! I loveeeeeeee Philly! I have taken one of those carriage rides there before... it's so FUN!!!!!! LOVING your lo!! I loveeeeeeee the photos and the colors!!! Can't wait to see pics of your vacay!!! Welcome back, Lisa! Your trip sounds like so much fun! We're about 1 1/2 hours from Niagara Falls so it's nice to visit (on the Canadian side). I love the layout design, especially the way you laid out of the photos and the big circle too! Welcome home, sounds like a fabulous trip! Love your layout! Sounds like an amazing trip. we are taking our family road trip in July, through the US up tp Ottawa. I hope to stop and see both sides too. (But as a Canadian, more excited for that side lol) Great LO too. sounds like you had a ton of fun! Great LO!!! Looks like you had fun and got a lot done! Did you go in the big ferris wheel at Niagra Falls? I went with my husband two years ago and was terrified!!! It was so high! Can't wait to see your pictures! Sounds like an absolutely wonderful time!! I will have to forward you an Email I got from my boss that shows a time back in the 30's or 40's when Niagara Falls was dry as they were fixing some enviromental issues...its weird. I've always wanted to see them and I love your blog header of the girls!! I also want to visit NYC..at least once :-) HOW FUN!!! Sounds like you had the best vacation! I'm not too far from Philly--you should have stopped by! Love the layout and your new blog header. It was interesting to read about your trip since visiting Niagara Falls is on the top of my Bucket List!!! It is good to know about the two sides. What a great trip. Sounds like a fun vacation! I love your layout! Wow, what an amazing trip you all were able to take!! SO many fabulous memories you made. Can't wait to see the photos! Love that layout, my friend! Such sweet photos and love the little hexagons. 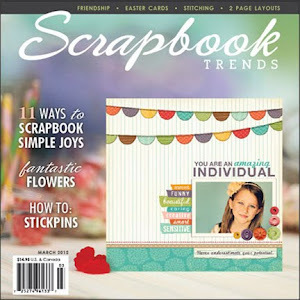 Scrapbook & Cards Today Winter issue RELEASE DAY!! !